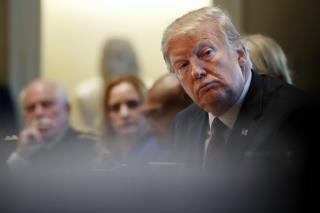 (Newser) – The New York Times has a new "bombshell" on President Trump, and it ties back to a probe into his potential ties to Russia—not Robert Mueller's investigation, but one reportedly opened by the FBI soon after Trump fired FBI Director James Comey on May 9, 2017. Sources say the president's behavior after that event caused the bureau to start looking into whether he was working for Russia against US interests (either knowingly or unwittingly), whether what he was doing posed a threat to American national security, and whether getting rid of Comey could be considered obstruction of justice. The Times pinpoints two specific instances that jump-started the inquiry: a letter Trump penned to Comey (and never sent) that mentioned the FBI's investigation into Russia, as well as an NBC News interview days after Comey's firing in which Trump seemed to suggest he fired Comey over the Russia probe. The logic used by the New York Times in its journalistic-knack to make two opposing things one, escapes me . . . that is, using a conflicted dichotomy of left-sided opinion, to meld a rational conclusion out of Trump’s opposing opinion, that he can be either impeached or convicted by all current published information, is, well, peregrinate at best . . . He fired Comey because he gave Hillary a pass on her crimes. The deep state must be crushed for the sake of all Americans. Only liberals are naive enough to believe they are on their side.